If someone asked me why I would want to make my own custom Leaf Spring “Shackles”, there is no shortage of answers I could give them. You reading this article tells me that you’ve probably already come up with a few reasons yourself. Shackles are one of the best projects you can do that includes most of the fundamental aspects of fabricating for a beginner. 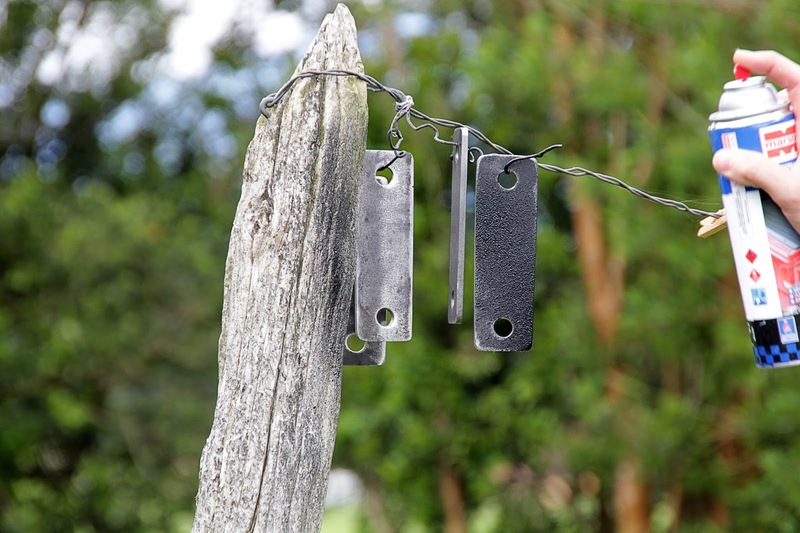 Skills such as precision measuring, precision drilling, controlled cutting, and final finishing are all required to effectively create good quality Shackles. Like anything, to get started with this project, you will need some materials and tools. Having a working knowledge of Shackles is also a benefit. However, if you are just trying to copy a Shackle style that you have seen before, this tutorial will show you how to actually go about the process. Designing a custom sized Shackle is a bit more complicated, and will not be covered in this particular article. 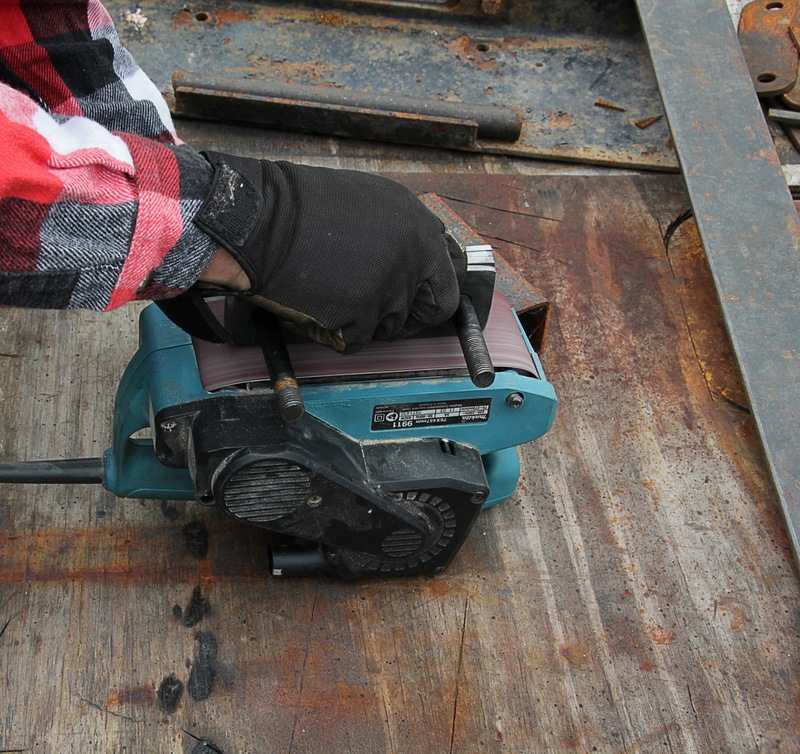 Once you have all your tools and materials together, it’s time to put them to work. So, here’s how you do it. Step 1: Measure Bolt Hole Separation: Find the center of each bolt hole, and measure the distance from each center point. 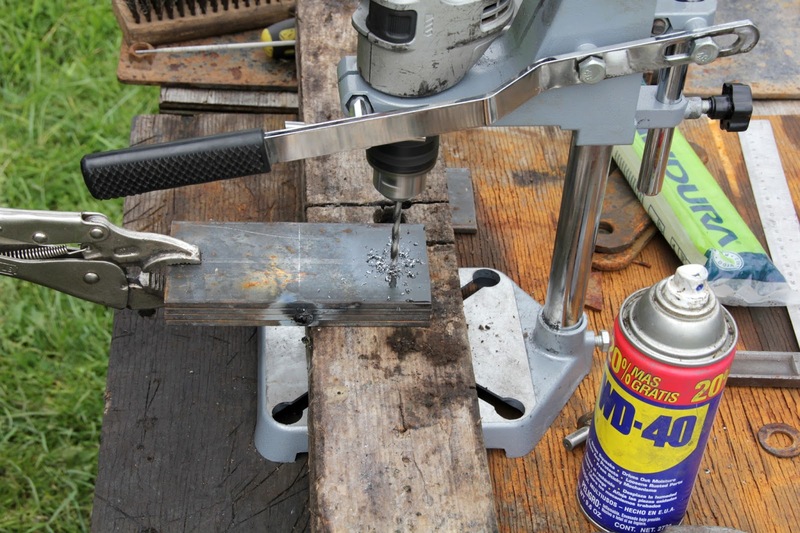 Then mark these points on a piece of rectangular steel stock. 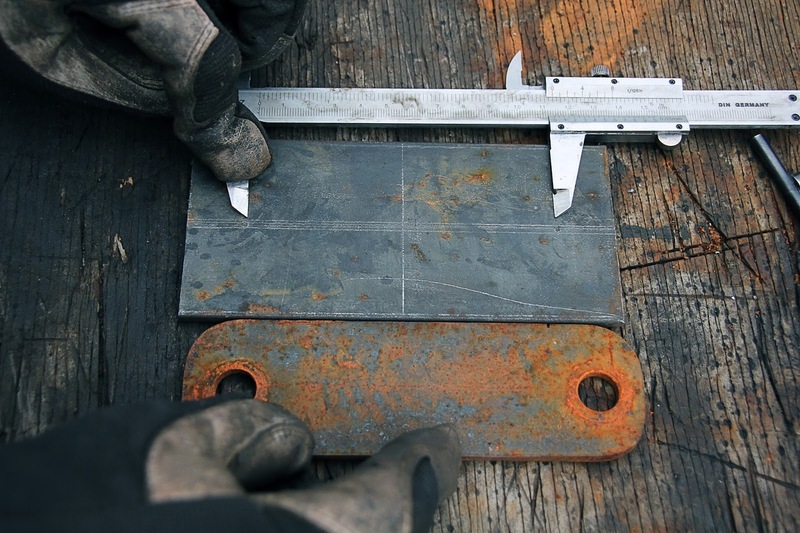 If you are using a sheet of steel, it’s a good idea to cut a few strips of steel out of the sheet. For most vehicles, shackles will not be over 2 inches wide. Make sure and check the width of another vehicle of similar size, or of the same make, and see what width the shackles are. Remember to make allowances for any adjustments to strength or length that you desire. 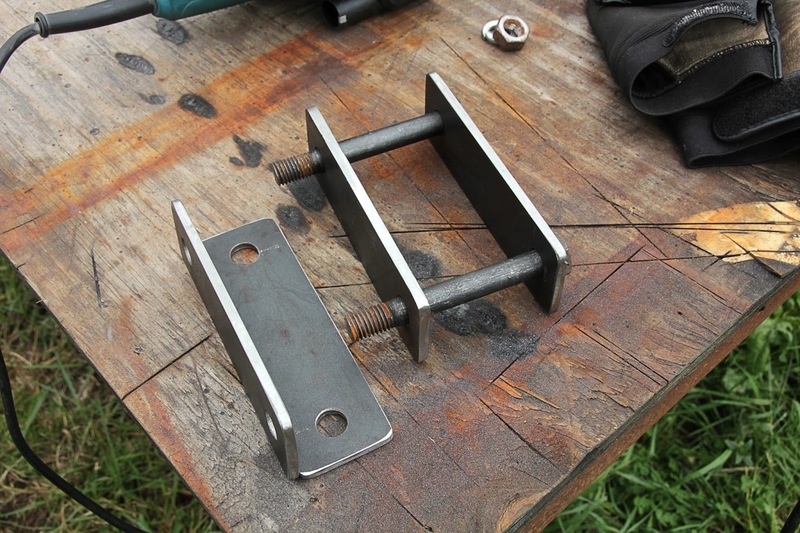 Step 2: Determine Overall Length Of The Shackle Material Needed: Once you have the center points of the bolt holes marked, measure (in apposing directions) the radius of the bolt hole, plus the shoulder width that will extend past the bolt holes on each end. As a general rule, I personally try and make the shoulder wide enough that it will extend past the head of the bolt, or the nut, that will be used to attaching the shackles to a vehicle. Step 3: Stacking The Shackles For Drilling: After the over-all lengths are cut, I like to stack all the Shackle stock pieces together. My goal is to make them as even, and as square as possible. Then I clamp them so that they stay aligned. 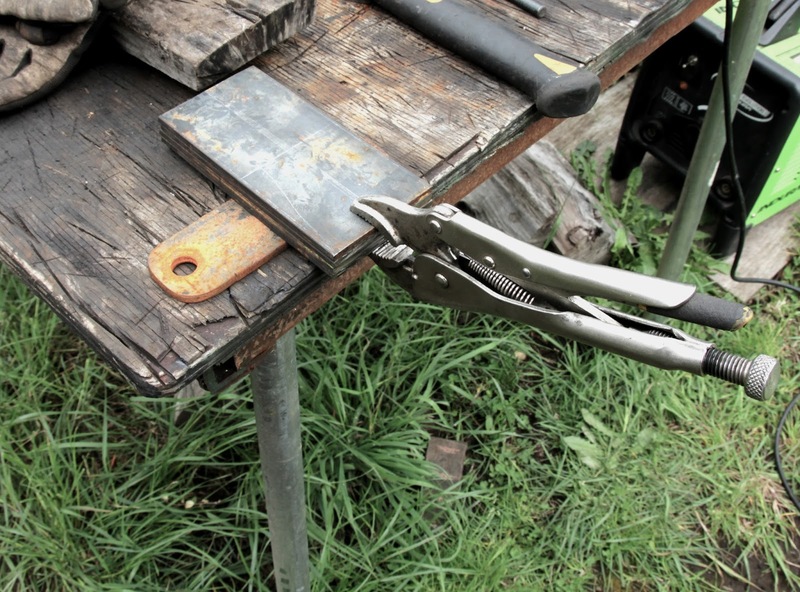 If possible, it can be helpful to tack weld them all together. This way they can’t slip around during the drilling process. 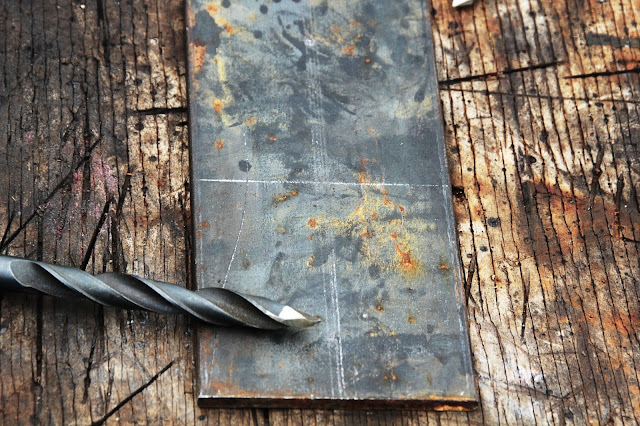 After the final marks are made, cut the steel to your determined length. Now, use an Awl or Punch and a hammer to create a punch mark on the center of each bolt whole that was previously marked. Keep in mind that it’s always better to measure 2, or even 3 times, and only cut once. Since the bolt holes in Shackles need to be exact, even if you think you have the correct measurements, checking them again is a good idea. Once the centers of the bolt holes have been punched, using a 1/8” or 3/16” bit and a lite lubricant, drill out the center of the bolt hole. 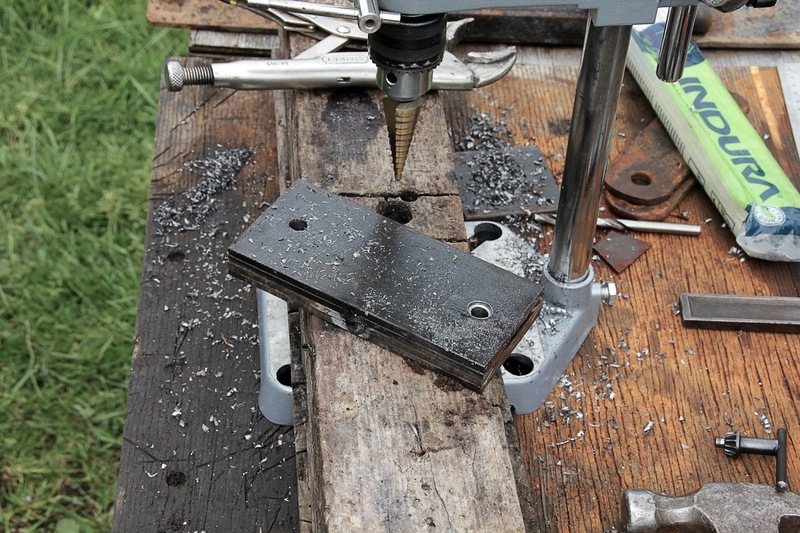 Then re-drill the same hole with larger bits, until the hole is the needed size. It’s a good idea to move up two or three bit sizes each time you re-drill the whole. Remember to lubricant the bit and steel frequently. Step 5: Refreshing Your Final Trim Lines: During the drilling and cutting process, some marks may be erased or covered over by other scratches or the use of the lubricant. At this point, it’s a good idea to re-draw the original marks and make any final design and shaping marks needed on the Shackle stock. Step 6: Trimming Up Your Shackles: Trimming up your Shackles can be a bit more challenging than you might think. Using an angle grinder with cutoff disks or grinding disks are very helpful. 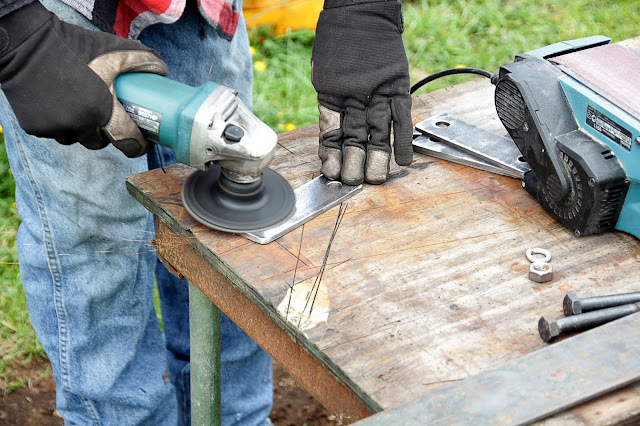 Other cutting tools can also be used if preferred. Always try and make straight vertical cuts while leaving at least a 1/16th, to a 1/8th, of extra material past the line that marks the final shape. Step 7: Shaping and Polishing: Since shaping, 4 Shackles at a time can be a very slow process; I often separate the Shackles apart at this point. Taking only 2 of the Shackles and aligning them together will make the shaping process much faster. You only see 2 Shackles per side. So, if one set is slightly different than another, no one will notice the slight variances. You can align the Shackles by eye, lining up the bolt holes on each end, or by using two bolts and stacking the Shackles on both bolts. Once the shackles are aligned, it’s a good idea to clamp them together. Using the sanding tools at your disposal, start to shape the Shackle while clamped together. Using two sets of clamps will allow you to keep the alignment of the Shackles when you need to move a clamp to a better position so you can shape all sides of the Shackles. My preferred method is to use a 60 grit flap wheel on my angle grinder to start with. Then I like to use my hand held belt sander (turned upside down) with an 80 grit sanding belt. Once all my corners, radius's, and flat areas are even and smooth, I use wet dry sandpaper to take off all the burs and soften the edges. Step 8: Prepping For Paint: Depending on the kind of paint you choose to use, you will have to sand your Shackles with differing grades of sand paper. In my case, I chose to uses spray can bed-liner. Because bed-liner needs an aggressive surface to adhere to, I used the angle grinder with a 36 grit flat disk. Using an orbital sander, belt sander, or hand sanding with sanding paper that is 36-80 grit would work well too. Just make sure to thoroughly sand the surfaces that are to be covered. Once all the pieces have been thoroughly been sanded, carefully clean and dry all the pieces. Detergents such as dish soap are good options, but you could use denatured Alcohol as well. Step 9: Painting Your Shackles: Always try and paint the Shackles while they are hanging. Make sure to space them out enough so as not to accidentally spray or touch a neighboring Shackle during the painting process. If it’s not possible to hang your Shackles while painting, you can also lay them on a table, and paint one side at a time. When this method is needed, try and place the Shackles on some sort of spacer, allowing the shackles to suspend over the table. This helps avoid create hard edges and runs. 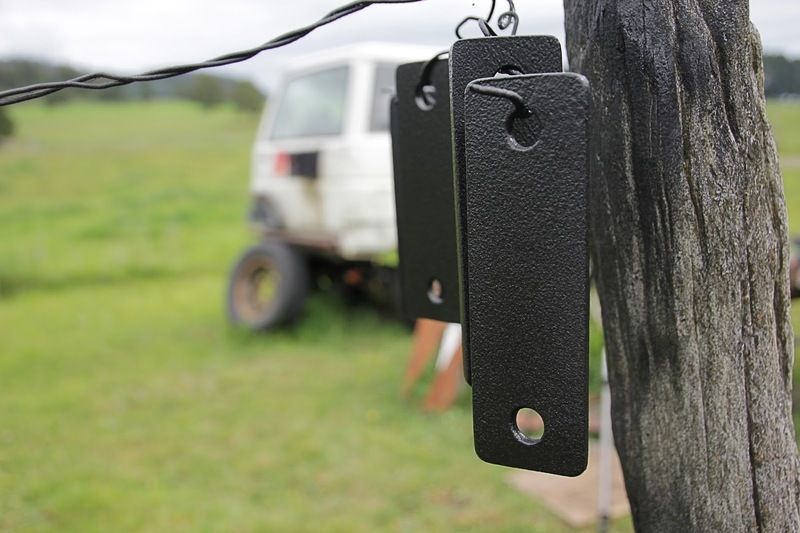 When painting your Shackles, apply a thin first coat. Make sure to paint the edges first. Then paint the main surface area. Follow the instruction for the paint you are using. Allow time for each coat to setup (tack up) before applying the next coat. Avoid getting in a rush and saturating the Shackles while painting. Doing so could cause noticeable flaws in the paints final appearance. 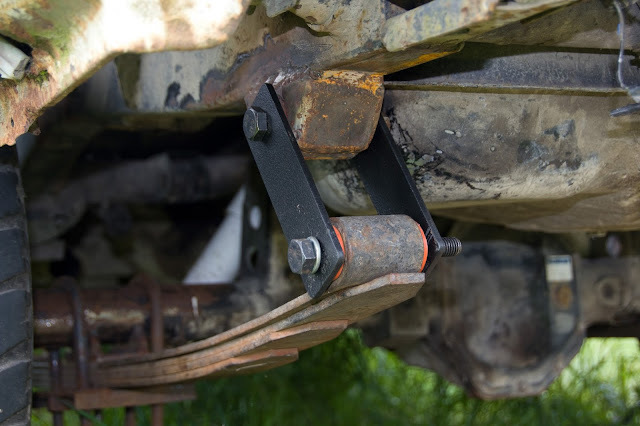 Once the paint has dried, it’s time to install your custom Leaf Spring Shackles. Now you can bolt them on. All that’s left after that is to get your rig off-road and see how well they work! Thanks for bringing this in my knowledge.